Pioneers in the industry, we offer brown basmati rice from India. 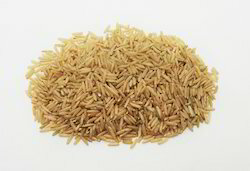 We are reckoned as one of major exporters and suppliers of supreme quality Brown Basmati Rice. Our offered rice is best known in the market for their excellent taste, uniformity and colour, owing to their procurement being done directly from naturally grown farmlands. We quality test these rice under certain nutritional parameters by use of advanced technology. Furthermore, we supply these in flexible packaging options which are hygienic and moisture proof.